Following in the footsteps and hoofprints of Beautiful Sheep and Beautiful Pigs, this awe-inspiring collection features commissioned photographic portraits of the best in bovine beauties. Placing the cows on the catwalk, an award-winning photographer captures them in all their glory. Each beautiful beast is shown posed against a drapery backdrop, and captured at her most manicured moment prior to competition. The top breeds from around the world are grasped by the horns and revealed to a doting public, and there are graphic charts with all the essential breed information. There's also a potted history of cattle, an introduction to the breed basics, plus reportage photography of the behind-the-scenes primping and preening at the agricultural shows. 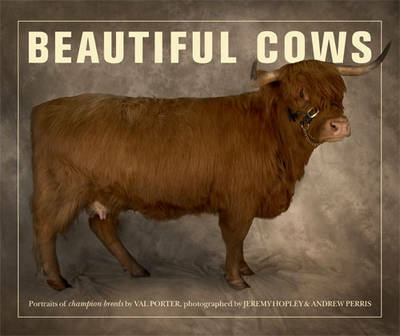 Beautiful Cows is the perfect book for anyone from farmers and committed cow connoisseurs looking to beef up their book collection to lovers of fine photography and natural beauty. An inspired gift, this is also the ideal conversation piece for any gathering-just leave it on the coffee table and prepare to milk the applause. You need only think of Sylvia Plath reciting Chaucer to a cow to appreciate their stoic majesty.